Helps Promote Normal Urination Patterns and Maintenance of Prostate Health. 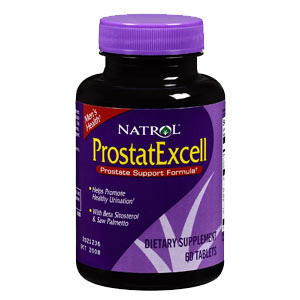 Natrol's ProstatExcell is a comprehensive multi-nutrient formula designed to support short and long term prostate health. This multi-nutrient approach includes the synergy of clinically researched herbs and minerals, with an array of vitamins and extracts to uniquely support your prostate health. Take 1 tablet in the morning and 1 tablet at night. For best results continue using ProstatExcell for at least 30 days. Other ingredients: Cellulose, Stearic Acid, Silica, Magnesium, Stearate, Hydroxypropyl Methylcellulose, Polyethylene Glycol, Hydroxypropyl Cellulose. ProstatExcell - is shipped in a discrete, unmarked package. Orders are processed immediately and usually take about 3 to 5 working days to be received. We do ask that you try it for 2 to 3 weeks to feel the full effects. Any information received is used only for order processing and shipping purposes. Your information, such as e-mail address, will never be disclosed to a third party.